Samsung is by and large the biggest single player in the AMOLED game, and in a post that details the shifting focus of display companies, Digitimes mentions casually that it will "launch a series of diverse models with increased pixel amounts of over 250ppi." The AMOLED display industry is slowly picking up steam, and moving from smartphones to tablets and even overly expensive TVs. Traditional players like AUO, CMU and Wintek are reallocating resources to more OLED screens production, while even the Chinese Visionox, Tianma and Irico are experimenting with 4.5-Generation production lines, meaning that they are developing their own OLED versions. Touch panel makers like CPT, HannStar and Sintek are also increasingly turning focus to specialized AMOLED touch overlays. Now what would these 250+ ppi pixel density models be? It is no secret now that the Samsung Galaxy S III will probably be the first featuring an HD AMOLED display with normal RGB matrix, and we also have the Galaxy Note and Nexus on the market, both already with 250+ ppi screens, but PenTile matrices. 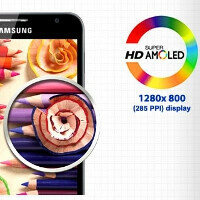 Could it be that an upcoming Super AMOLED HD Plus tablet is also in the works then? For the rumored 11.6" tablet from Samsung to have 250+ ppi density, the resolution will have to be something in the realm of 2560x1440, which brings back 253ppi, so we cross fingers the high-res AMOLED rumor applies to Samsung's upcoming tablets as well. After all, the Koreans broke a football field-worth of display glass until they arrived at the tech for the Galaxy Nexus screen, so we keep our hopes high. I would sell my ipad 2 and buy this if it were to come out. Isn't it still a "secret" if your SGS3 screen rumor is a "probably"? Samsung has to put in some extra twist to the super AMOLED plus HD panel as AMOLEDS in general are facing strong competition, from LCD tech, say, the HTC One X's SLCD 2 panel which displays amoled like saturated colors. I would prefer an Amoled HD display with touch feedback(well, I meant the electrostatic 'feel' display), and zero lag. Now if only they find a way to eliminate burn-ins... My SGS2 suffers from it slightly, and i can only imagine what it would look like on a TV.